Hummus is a creamy dip that's a favorite protein source for vegetarians and a popular appetizer at parties. It's low in fat, cholesterol free, and is traditionally made with garbanzo beans and heart-healthy olive oil. You can also make hummus from black beans, white beans, edamame, and even lentils! But makers of the store-bought versions get really creative when it comes to flavored varieties of traditional hummus. Hummus is a creamy dip that's a favorite protein source for vegetarians and a popular appetizer at parties. It's low in fat, cholesterol free, and is traditionally made with garbanzo beans and heart-healthy olive oil. You can also make hummus from black beans, white beans, edamame, and even lentils! But makers of the store-bought versions get really creative when it comes to flavored varieties of traditional hummus. From scoops of garlic to diced jalapenos and cilantro to Greek olives, there are a wide variety of flavors to satisfy your taste buds. Everyone at Health loves hummus, so our staffers picked one flavor for a taste test: Red bell pepper. We tried two varieties of Tribe Red Bell Pepper Hummus: Spicy Red Pepper and Sweet Roasted Red Pepper. The Spicy Red Pepper had a definite kick. It’s one of those “spicy” tingles that comes into effect after you've eaten a bite. The flavor was good, with fresh, chopped bell peppers in the center on top to mix in, but needed a little more all-around flavor from the beginning of the bite to the swallow. We loved the Sweet Roasted Red Pepper, the taste a welcome change to other varieties that we tasted. This came in as our second favorite. 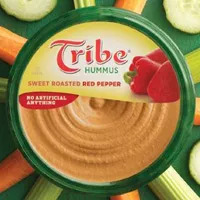 Tribe makes 13 different varieties of hummus and single-serve snack packs. We tried three varieties of Cedar’s Hommus: Roasted Red Chili Pepper, Roasted Bell Pepper, and Organic Red Pepper. The Roasted Bell Pepper was the overall winner of the taste test, receiving the popular vote from many of our editors. The texture was thick and creamy, with tiny chunks of roasted and spiced red bell peppers that were spread throughout the dip. The flavor just seemed to pop. We also loved the snack packs, which contained pretzels or gluten-free chips. Cedar's also makes salsa, spinach dip, tabbouleh, wraps, pita chips, and tzatziki. What Can You Make With Chickpeas?